This Fighters Guild is a guildhall housing the Skywatch branch of the Fighters Guild. It is located to the southwest of Skywatch Manor. 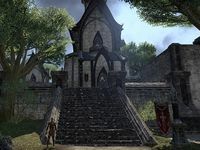 The guildhall is a two-story Altmer-style building with a vast outdoor area and an archery range at the back. There is a staircase found on the southern side of the city central park which leads to the guildhall outdoor area. Vaford's tent is set up here. The tent has several storage containers near it and a couple of weapon and armor stands inside, all of which hold owned items. Opposite the tent, surrounded by Guild Blades, is a keg which can contain a free drink. Nirthindor and Sevame Dreth can be found at the archery range, practicing. Quite a few Guild Blades, training, relaxing and utilizing the archery range reside in the outdoor area. The hall steward can be found inside, on the ground floor, which consists of one room. The room is divided into a resting area with two bunk beds and a folding screen on the left and a training area with weapon and armor stands and two training dummies on the right-hand side. A Guild Blade hones his fighting skills here. There is a bookshelf here and a map of Cyrodiil on the wall. There can be a safebox on the bookshelf. Upstairs is a roofed open-air area with four balconies on each side of the guildhall. A skyshard can be found on one of them. All the barrels, sacks, crates and baskets scattered around the building are owned. This page was last modified on 19 November 2018, at 06:16.